When Laura turned 7 years old, she asked friends and family members NOT to buy a gift for her but instead to make a donation to the homeless animals of the Medfield Shelter. What a truly kind and thoughtful deed especially for such a young child. There is hope for a better tomorrow for companion animals and that hope is evidenced in powerful gestures like this one. 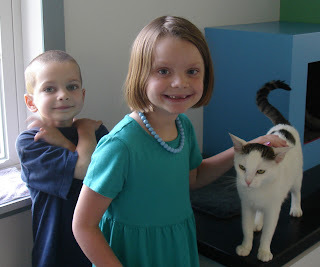 Laura is shown here with her younger brother and Penny, one shelter resident who will benefit from Laura's kindness. An act like this goes a very long way to making the Medfield Animal Shelter a love-filled temporary home for our companion animals. We are so very thankful to Laura (and her family and friends) for her kindness and generosity.